The Shakespeare Theatre Company's current production of Macbeth is an excellent example of how putting a "modern" spin on a classic can make a timeless story seem stale. Liesl Tommy has turned Macbeth’s medieval Scotland into a post-Arab Spring North Africa, and while the staging is thrilled by its own cleverness, it fails to deliver more than soon-to-be-dated comments on current events elsewhere in Washington. So much is played ironically and with knowing looks that the horror and the heartbreak of the play don’t really penetrate. There is little terror and no awe; only cynicism. By trying to be smart, Tommy has only dumbed down Shakespeare's tragedy. Macbeth (Jesse J. Perez) is a corrupt general scrambling for influence in a time of chaos and civil war. The Witches (Tim Getman, David Bishins, Naomi Jacobson), reimagined as CIA agents, turn Macbeth into their puppet-dictator with gifts and PowerPoint presentations of intelligence gathered by assets and agents "eye of newt" and "toe of frog"; by the end of the play, he is one pair of mirrored sunglasses away from being a broad SNL impersonation of Muammar Qaddafi—evil, yes, but also a bit absurd. He is often charming and funny, but he is neither impressive nor intimidating. 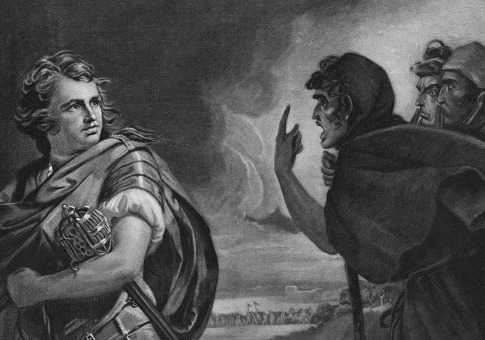 The text of Macbeth describes a great warrior and a good man becoming a bloodthirsty tyrant. The tragedy is in the transformation. But Perez begins and ends the play as more-or-less the same: a debased sap without any shame, manipulated and prodded to his doom by others cleverer than he. He is never terrifying, even after we have seen him do terrible things. Nikkole Salter is a gentler and subtler Lady Macbeth than the usual henpecking scolds and femmes fatales. She wears a series of beautiful head coverings that get larger and larger, making her husband look smaller and smaller as he is supposed to be getting more powerful. But she seems to lack awareness of the costs of their growing power; madness, when it comes, seems to come out of nowhere. Salter's Lady Macbeth lacks the scorpion instinct, the gravity, and grandeur that make her character infamous. When we begin the play, she appears as a kind of sophisticated Desperate Housewife in a Harvard t-shirt. (Several of the "evil" characters wear American logos: Mickey Mouse and Coca-Cola also make an appearance.) She pops pills and drinks wine. She doesn’t come off as particularly ambitious, but rather as restless, overeducated, and depressed. This Lady Macbeth's motivation is clear: the loss of her child. She becomes attached to the idea of killing Duncan and making her husband king not so much because she longs to be queen, but because the intrigue and danger of regicide are exhilarating distractions from pain. The conceit works for awhile but ultimately undercuts the power of Shakespeare’s character as written. Nevertheless the decision to place children at the center of Macbeth is the smartest part of this production. The play begins with the sound of a baby’s cry, which is replayed whenever there is a moment of tension between Lord and Lady Macbeth. When Macbeth appears to back down from his promise to kill the king, he attempts to flatter his wife by saying she will "bring forth men children only." This line makes her burst into tears. He is so shocked and appalled by his misstep that it is in this moment you know Macbeth will carry out his mission. He obeys her not out of fear but out of guilt. He would do anything—terrible things—to make her happy and stop her crying. On his way to kill Duncan, Macbeth comes upon his friend Banquo (McKinley Belcher, III) and his son Fleance (Brett Johnson). This production has Banquo teaching his son how to duel with swords when Macbeth encounters them. Macbeth watches the father arm his son; he watches their weapons flash. In the next scene, when he says, "Is this a dagger I see before me?" he appears to see not just a sword that he will use to kill a king, but the sword he wants to pass down to some future heir. Kings must have heirs, after all. Becoming king and having children are fused together in his mind. It’s an interesting and apt characterization. Moments like this could help an audience understand how a once-noble man like Macbeth could be tempted into evil. But this Macbeth is never noble, so we are not surprised when he orders the murder of his best friend, or of someone else’s children. In this Macbeth, questions of free will and fate, of madness and the nature of evil are replaced with policy critiques and salty jabs to make Beltway audiences chuckle. A line about an "equivocator" who commits treason but cannot "equivocate to heaven" becomes a line about a general who cannot "get immunity" to get into heaven. When the American Witches summon their unseen master, Hecate, she speaks with a Russian accent. These tweaks get easy laughs, but they distract us from the deeper problems explored in the play. When your witches and demons are merely snarky human beings, and when Macbeth's wretchedness is a given rather than a transformation, the stakes of the play are depressingly low. The standout performer in this production is certainly Myra Lucretia Taylor, who plays both the drunken Porter and the doctor who treats Lady Macbeth. It's a smart decision to double cast these roles, for it highlights the fact that the two are similar. The Doctor and the Porter both address questions about human agency in the face of damnation. It's the central question of the play, one that’s sadly neglected by this production. If a noble Macbeth can be tempted, we can be tempted too, so we watch his degeneration with horror. But when Macbeth is played as a contemptible fool, it just doesn't work. We are not his comrades; we are his superiors. We can watch comfortably, judging him and even laughing at his antics. Maybe that’s the most disturbing aspect of this production—it shows us how easy it is to become blasé about terrible things. Indeed, Tommy’s Macbeth puts us in league with the all-knowing, jaded witches. We’re not shocked or saddened by Macbeth’s downfall. We expect it. We’ve seen it all before.